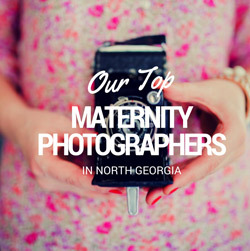 Our Top North Georgia Maternity Photographers! Why we love her: Besides being a fabulous and super sweet woman and mama, she takes some dang awesome pictures! She wields her camera and captures expecting moms in a way that exudes serenity, peace, and love with a touch of whimsy. Many of her sessions are done outside and there is just something so natural, so elemental about seeing these women in nature that takes your breath away. Check out Amanda Nicole Photography here. Why we love her: I have heard some rave reviews about this awesome photographer. She has some stunning photos of women outside in nature but it is her studio photos that we really love! She photographs women in such a way that it brings out an almost classical elegance and lets their strength and confidence shine. She also went to the same college as I did, so maybe I’m a little biased. Check out Jessica Tanner Photography here! Why we love her: Wendy has a talent for snapping a picture at exactly the right moment. When her subjects true self is on display. In a moment of true joy, or peace, or love. She captures the complex emotions of a moment beautifully to enjoy for a lifetime. Check out Wendy Lynn Photography here! We know that if you choose any of these three incredible photographers you will not be disappointed!